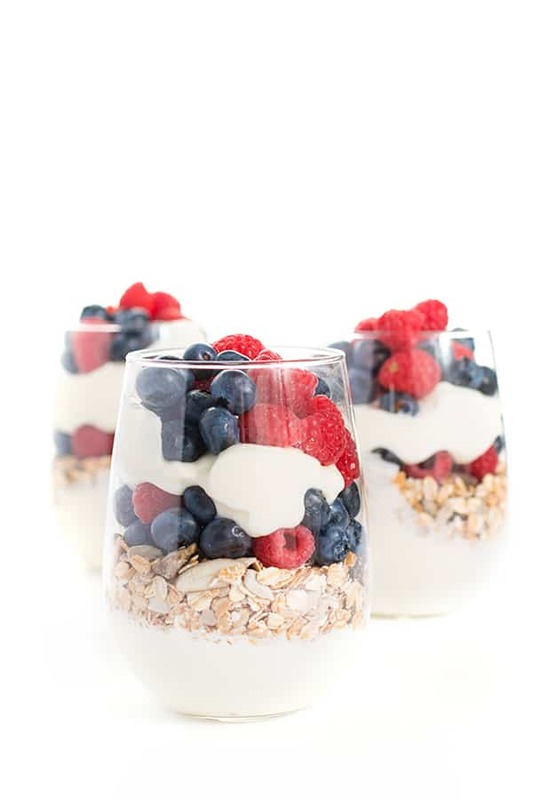 These Make-Ahead Fruit and Yogurt Protein Parfaits are an easy, make-ahead breakfast packed with plenty of protein and heart-healthy fats to give you all day energy. 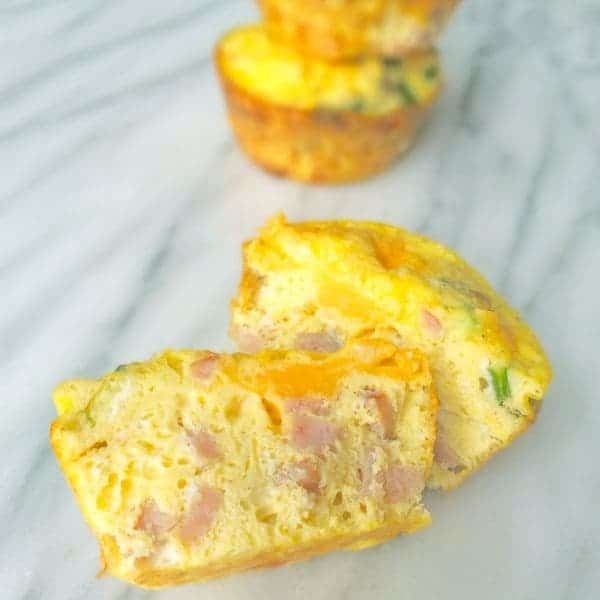 My husband leaves for work around 6:30am most weekdays so I love coming up with easy, make-ahead breakfast ideas that he can quickly eat before heading out the door. While he loves eating dry cereal (no milk!! ), I would rather push the envelop and get him to eat a more well-rounded meal that includes protein, calcium and at least one serving of fruits or vegetables. In fact, my Ham and Cheese Baked Egg Cups were the result of an earlier quest for a nutritious make-ahead breakfast. I went the classic route with ham and cheese but he actually enjoyed his with roasted broccoli, kale and feta. They were a huge hit and I will definitely be making these again soon. 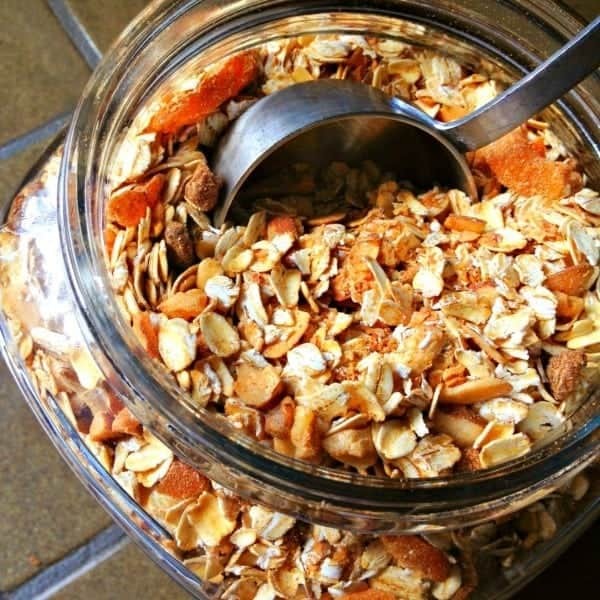 Another item I always have on hand is Homemade Instant Oatmeal Mix. My husband loves dried apricots and I love walnuts but you can customize this recipe with any of your favorite dried fruits, nuts or seeds. These Make-Ahead Fruit and Yogurt Protein Parfaits are ideal for making ahead on Sunday and enjoying throughout the week. Walnuts, pumpkin seeds, chia and flax seeds will give you the ideal balance of healthy, monounsaturated fat and protein. The yogurt is sweetened with a little pure maple syrup which plays off the warm cinnamon and cloves in the nut topping. 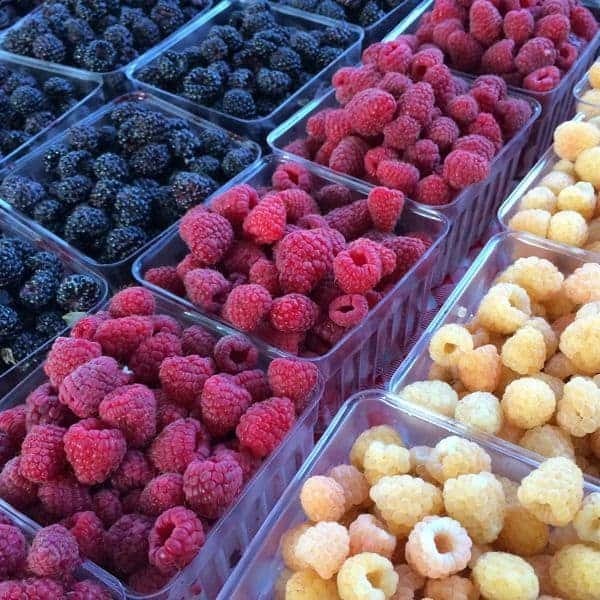 We are still in the height of berry season here so I used fresh raspberries and blueberries but feel free to use any of your favorite fresh or frozen berries. The options are endless. These Make Ahead Fruit and Yogurt Protein Parfaits is packed with plenty of protein and heart-healthy fats to give you all day energy. In a medium bowl, whisk together yogurt, maple syrup and vanilla. Pour into a liquid measuring cup and set aside. In another bowl, mix together seeds, nuts and spices. To assemble parfaits, set out five glasses or mason jars and pour in 1/4 cup or so of the yogurt mixture into each glass. Top the yogurt layer with a couple tablespoons of the nut and seed mixture. 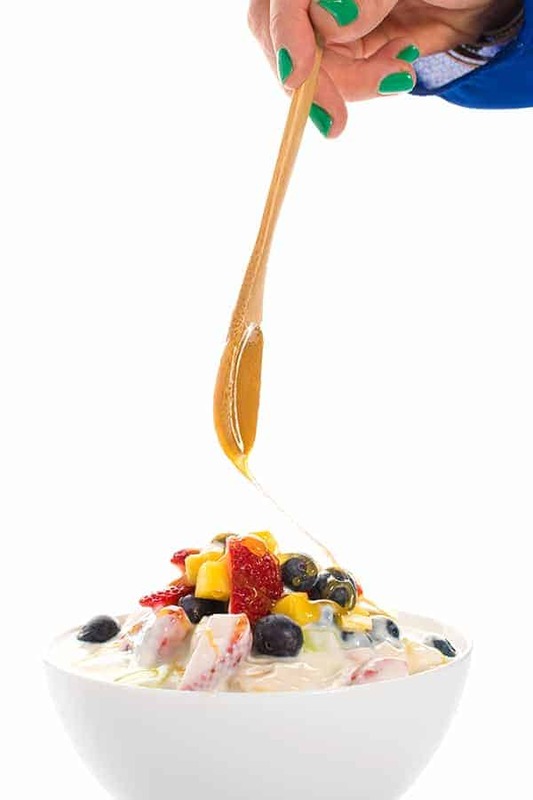 Sprinkle a couple tablespoons of berries on top of the nut mixture then begin again with yogurt. Repeat the layers until all ingredients have been used. Seal mason jars or cover glasses with plastic wrap until you're ready to serve. These will keep in the refrigerator covered with plastic wrap for up to 5 days. Oh man my husband is an Oreo addict. I get it! Healthy breakfast never looked more gorgeous! Loving this parfait, Liz! Pinned! These are awesome! I love anything I can just grab and go! Grab and go is my favorite type of food these days! Let me know what you think of it Susan! Eating this for breakfast would put a huge smile on my face :). 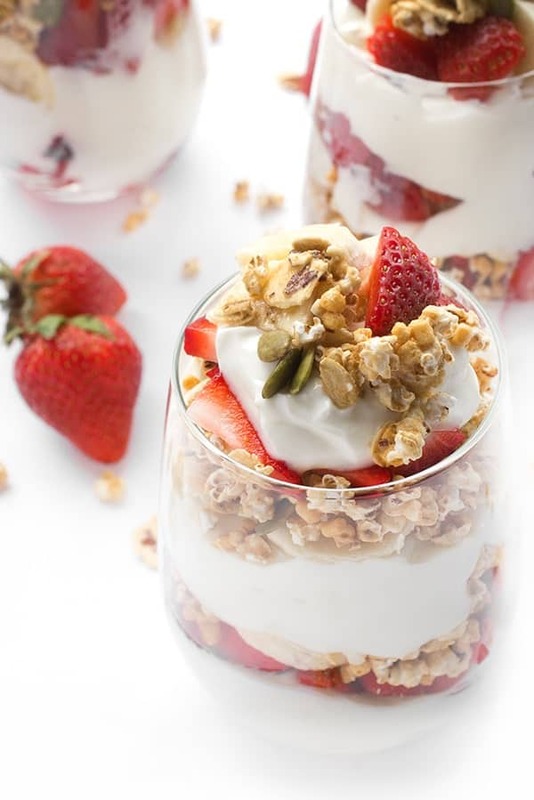 Nothing better than fresh fruit first thing in the morning, except when they come in cute little glasses alongside yogurt and some other goodies… infinitely better! There is nothing better!! Thank you Kathi! do these get soggy after being in the fridge for a while? looks yum, thanks! They did not! I think you’re good as long as you don’t stir it. Enjoy! I am a big fan of berries and parfaits, so this would be the perfect breakfast recipe for me to try! You and me both – I hope you enjoy it Tori! This is my kind of breakfast! Filling and so delicious! I didn’t make them this week and Rich was mad – haha! Love that you use honey! This is just what I need…I’m all about make-ahead breakfasts! Tell me about it!! Life saver!! 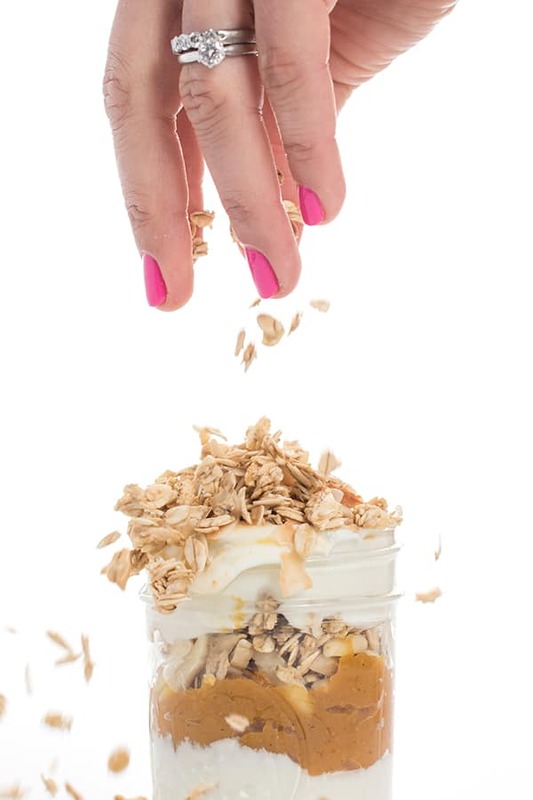 We’re addicted to anything with yogurt or anything resembling granola around here, and despite no one leaving the house at 6:30, this mom really likes the idea of make-ahead breakfasts. Yum! These would be absolutely perfect for my hubby too! I am always on him to stop eating ALL the carbs, and get more protein…I think he will eat these happily! Pinned!